This town-home features three stories and four bedrooms. The top floor has three bedrooms with one queen bedroom and one king bedroom that share a bath, and one master bedroom with a private bath. There is one queen bedroom on the main floor, a bathroom, living room, and kitchen. The bottom floor has a game room with a pool table, Wii, and more! 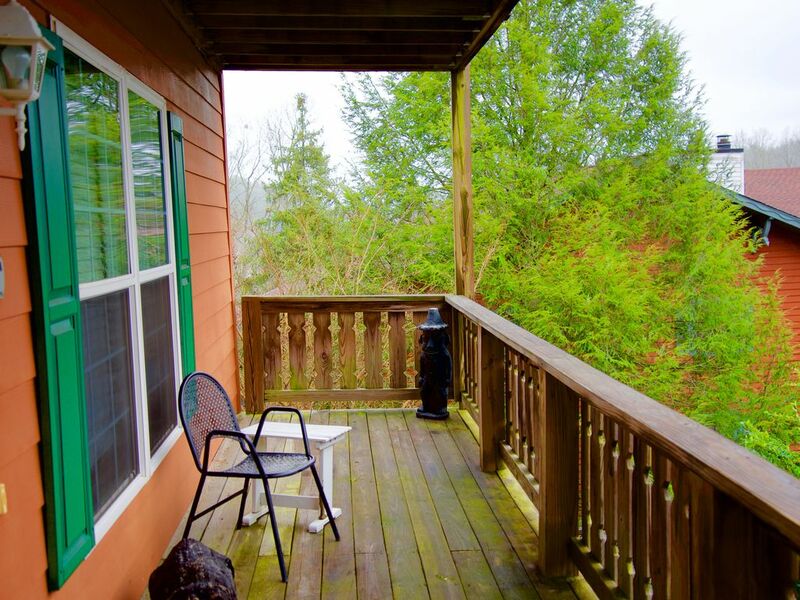 For the in-between times enjoy the hot tub and jacuzzi tub, or sitting on the porch overlooking the town of Helen. This property includes our Xplorie Activity Program. For each night you stay with us, you will receive one free adult admission to one of eleven different activities. From zip line tours and panning for gemstones, to miniature golf and laser tag, play while you stay! It was amazing time. Loved it. vcations was great... the house has a few issues that could have been addressed.. did not know of the steep driveway until i called a few days prior to confirm.. Thankful there was no snow or ice, because this would have been a big issue.. the hot tub didn't work,, while it rained the ceiling leaked in the master bath. I have booked with Georgia Mountain Rentals for years and have always been pleased. Only complaint from guests about this rental is the barking dog next door. Precious, but barked. All night. Some rooms were more disturbed than others. Great space for a stay! We brought the whole family to celebrate our Dad's 70th Birthday at Oktoberfest in Helen. This was the perfect place for us. We each had our own bedroom, plenty of bathroom space and we loved the game room. We were also happy to be able to easily walk to all the fun activities in Helen. We will definitely stay here again! We absolutely loved this place!!! There was lots of room for our family and we loved every minute of our stay. There was a lot of steps, but it wasnt anything that we couldnt handle. We will be staying there again for sure!!! Year Round 2 Night Minimum.